With the advent of virtual reality (also commonly referred to as VR), there has been a lot of talk in tech and entertainment about what this new technology means for their industries. But VR is expected to have a much wider-reaching impact, and is already affecting the way some doctors approach Alzheimer’s care. VR’s impact can already be seen – albeit, in a limited way – in how a handful of doctors and researchers are diagnosing and treating the disease. Read on to find out how Alzheimer’s care professionals are already using VR and the ways this new technology may affect the future of Alzheimer’s and dementia treatment. Alzheimer’s has already become remarkably easier to detect thanks to VR technology. In October of last year, German Alzheimer’s care scientists published a study in which they used a virtual maze to help detect Alzheimer’s. In the study, the scientists tested people between 18 and 30 years old and had them try to navigate a VR maze. Amazingly, this test proved successful. Based on how different people moved through the maze, the scientists were able to accurately identify which subjects held genetic markers for Alzheimer’s. This means that with the help of VR, scientists can diagnose high-risk patients as young as 18 years old, allowing families to plan for future Alzheimer’s care. VR has already made its way into Alzheimer’s treatment in a handful of trials by leading Alzheimer’s care professionals. One such trial, performed in 2014, used Microsoft Kinect technology to create peaceful scenes – such as a sunlit forest – that Alzheimer’s sufferers were able to interact with. Another more recent trial This type of treatment is called “sensory therapy,” and are touted for their safety and therapeutic uses. Normally, it is too risky to introduce Alzheimer’s sufferers into certain environments, no matter how relaxing. But with VR, these Alzheimer’s care professionals have been able to build relaxing environments where patients are totally safe. Since virtual reality is still in its infancy, it is tough to predict exactly how much of an impact this technology will have on Alzheimer’s care. Many people see a lot of potential in VR’s therapeutic uses, and as the technology becomes more widespread, accessible, and affordable, we may see VR play a much bigger role in treatment. One exciting possibility is the creation of virtual environments that remind Alzheimer’s patients of their childhoods. It may even be possible to create customized environments for individual patients, introducing music or details that are particularly soothing. 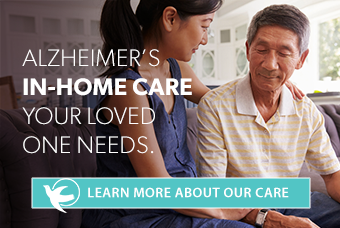 To connect with your local Alzheimer’s care experts, call your local Visiting Angels office today.